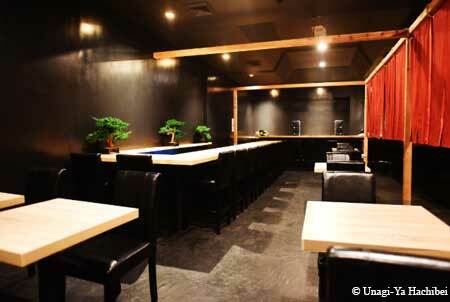 Midtown East Japanese restaurant featuring unagi (freshwater eel). : Unagi, or freshwater eel, is the star of the show at Unagi-Ya Hachibei, a Japanese restaurant in an intimate townhouse dining room decorated with black walls and red curtains. The delicacy is served grilled and brushed with a sauce from Kyushu, an island in southwestern Japan.